Pan is known as the Greek God of Nature. He is portrayed as having the hind legs of a goat and the torso of a man. Many people describe Pan as a type of Fawn. However he explained to Alphedia he is one of a race of beings known as a Gohart. Goharts guard the mountain sides and oversee all who dwell in their environment. Pan is an intermediary between the world on Earth and the higher realms. The purpose of Goharts is to combine the two the two races of animals and man. 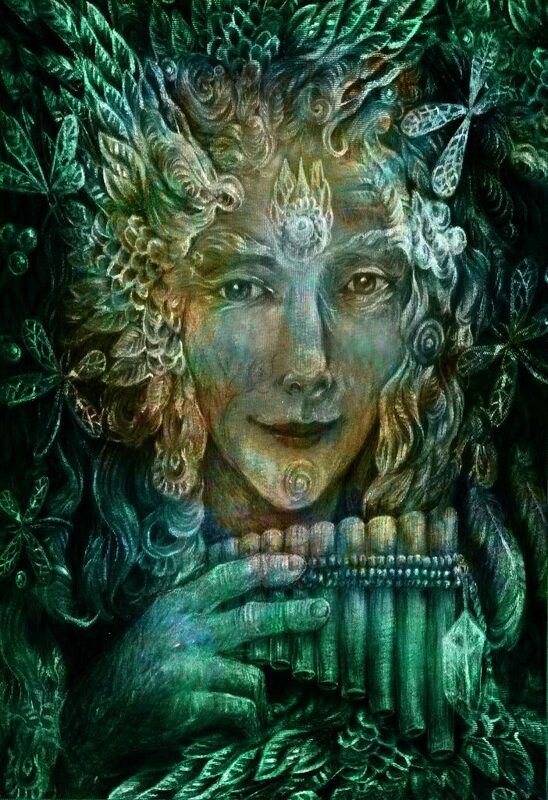 Pan is particularly keen on helping us at this time to work with the Elemental realm and to have a closer connection with nature. He can be called upon to aid you in your environmental work and to open up your sixth sense more fully. “I am the Great God Pan, I have come today with a message for your fellow elemental clan. I am the Greek God of Nature and it is my role along with other environmental deities to oversee the environmental systems occurring on planet Earth. For as the planet’s consciousness elevates, that of the elemental realm elevates too. More and more of you humans will start to see see, feel, hear and be aware of the nature guardians around you now. For just as human civilisation is ridding itself of its collective fear, the elemental realm – that of the fairies, mermaids, unicorns, sprites, undines, gnomes, and the many more, are releasing their collective fear of human society. Just as the human race has had to go through a period of readjustment with regard to financial systems crashing, your companies going into receivership and your political system being purified. The elementals too have had to face up to the attitudes in their realm that no longer serve them. They are now extending out the hand of friendship for those humans who wish to take it. All they ask is that you believe deep within your heart that they are there, even if you are still unaware, know that they are there. For the nature angels, as they are sometimes known, are wanting to work in harmony now with the human realm, they understand that not all humans are bad, and in fact most humans are willing to help heal the environment, animal kingdom and Planet Earth. As the Planet moves away from the root chakra concerns in the human realm, they will start to see how the elementals create their reality, which is through thought forms alone. For when a fairy becomes annoyed at a human who has squashed its plant, it send out a thought of annoyance which a sensitive soul will pick up. At a certain level they know what they did was wrong. When a fairy sends out loving thoughts the humans the humans will smile. “The time has come to acknowledge more the existence of the Elemental realm. Fairies are the most famous group but the Sylphs have the greatest plight. No more can they control the wind and weather patterns as is their job. These volatile gases which are often man made occur in too great quantities now and their unchecked effects spiral out of control. I urge you humans to take action now, help the plight of the Sylphs and the other Elementals for no one group is affected solely. Once one area is out of balance then all systems are. “The light has entered allowing the darkness to fall away. The planet is reclaiming her own and calling out to those on the spiritual waves to connect again with her plight. Help her Elementals and devas, her plants, trees, seas, skies and ores. We need now more than ever to raise the collective consciousness to the importance of connecting with spiritual beings to aid you on the earth at this time. Belief is key yet souls who do not yet have the belief need treated gently. They need compassion, guidance and understanding. For it is only fear that blocks their understanding of earth as a whole being, sentient and communicative. Everything is energy and everything is conscious. Lead the way, shine your light and most of all have compassion. Clear the fear through love. Surround any troubling situation with love and open your arms to allow the angelic beings of light to enter.